Ben Penner and Andy DeLuca display seedlings planted by students in the January Interim Experience class. Gustavus Adolphus College senior Andy DeLuca is a music education major. He spends most of his time in the fine arts building and Christ Chapel, playing music or helping with Daily Sabbath services through his student employment in the Office of the Chaplains. But when DeLuca looked at the January Interim Experience course listings this fall, a class called Culture, the Self, and Agriculture caught his eye. The class met Representative Samantha Vang ’16 during a visit to the Minnesota State Capitol. Throughout the month, DeLuca and his classmates have explored their own relationship with agriculture and the complexity of the agricultural industry, the policies and systems that impact and influence food production and delivery, and how climate change and agriculture intersect. Ben Penner, a local organic wheat farmer who uses sustainable practices, teaches the course. Readings for the course include The Good Food Revolution by Will Allen, and The Great Derangement: Climate Change and the Unthinkable by Amitav Ghosh, who will visit Gustavus to speak at the Nobel Conference 55 on climate change this September. Saint Peter area Representative Jeff Brand meets with students to discuss agriculture issues. 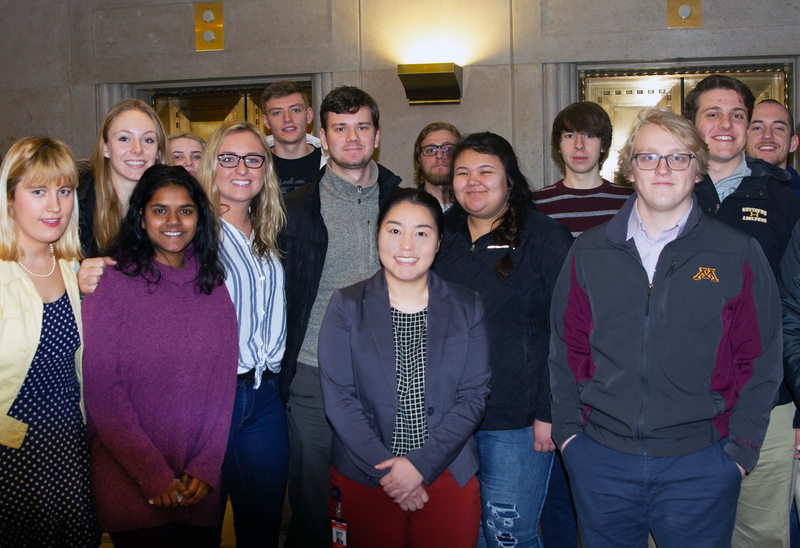 Outside the classroom, the class visited a farm, prepared seedlings in the Nobel Hall of Science greenhouse using sustainable planting methods, and attended a Minnesota House of Representatives Agriculture and Food Finance Policy Division committee meeting. During the public comment period, Penner introduced the students and told representatives about the students’ research and projects on how climate change can be addressed through practices such as no-till agriculture. 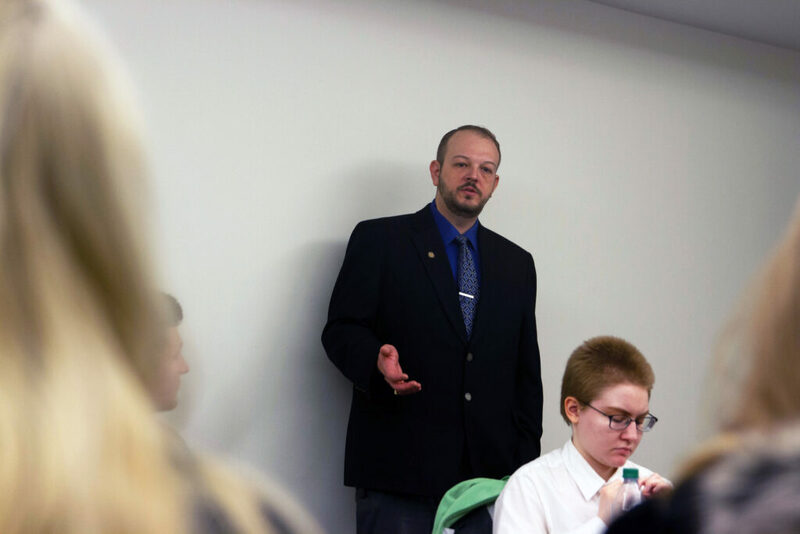 At the committee meetings, students also heard from many agricultural organizations that illustrated the diversity of the industry, including the Minnesota Corn Growers Association, the Minnesota Pork Producers Association, and the Minnesota Farmers Union, among others. During their time at the Capitol, students caught up with Representative Samantha Vang ’16 and met with Saint Peter area Representative Jeff Brand to discuss issues of agriculture and sustainability. As the January class wraps up, students are hard at work on their final project, which consists of developing a product, service, business, plan, or campaign that addresses climate change through agriculture. 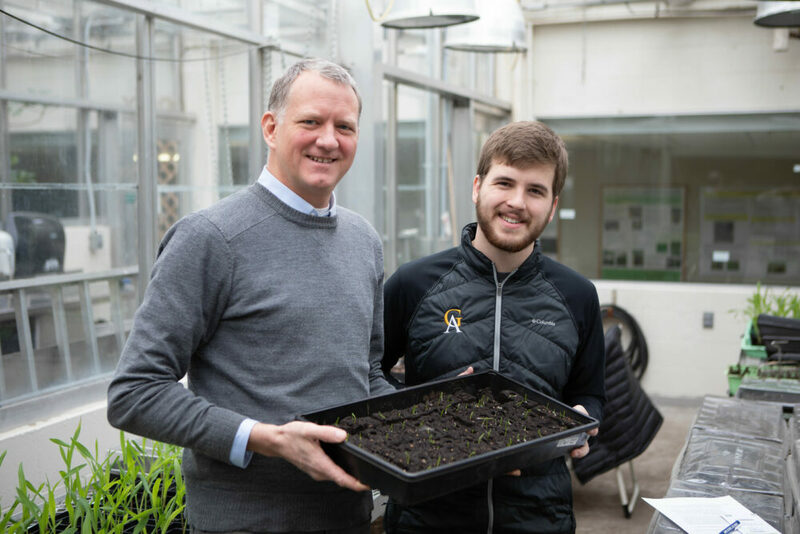 “Learning the importance of agriculture and its role in climate change has let us see our own roles in fostering a sustainable world,” DeLuca said. combining, classroom, independent study, and my favorite, field trips. We used to do this sort of thing as regular offerings during J-Term. Bob Douglas took students to a number of archeological sites and I took students to San Francisco. As you all know, field trips have been a part of geographic inquiry for a long long time and the Gustavus J-term (we no longer use that term – too bad) allows students to concentrate on one course for a month. Hope we can keep that option alive for students. Thanks, Ben, for offering this course! Three cheers!! Ben:This sounds just like a J Term course should be-discussing a relevant pressing issue, hitting the road to meet folks who are knowledgeable on the subject, doing hands-on work.The grand idea of J Term was to offer a class of this type and now there are so few like it.Kudos.In fact, it should be a new course in the Geography Dept. My daughter was in this class and said it was amazing! She learned a lot and appreciated Mr. Penner’s teaching. She’s so glad to be at Gustavus! I took today’s e-mail clickbait because the article was about J-Term, and then found comments by two of my Gustavus Geography Heroes! Over forty years later I continue to seek and make connections with the people, literature and music introduced to me on that incredible trip. Thanks Bob!